It's month of October and son's still having exam this week. However I am excited as it's just few weeks away and it's my birthday in November. 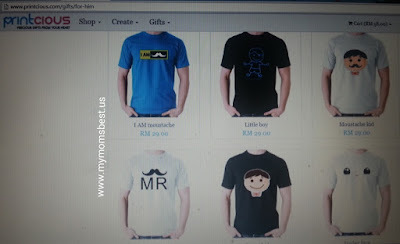 I found this website named Printcious, it has many t-shirts to choose from. 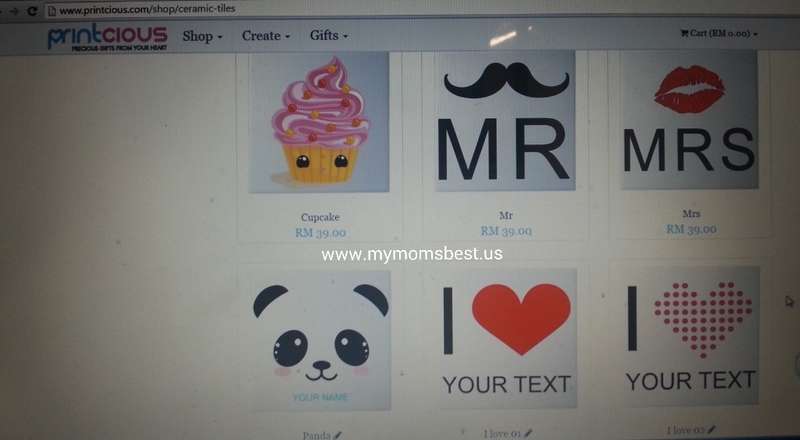 There's also cushion and ceramic tiles that you can choose for your loved ones. I love the name of printcious, which means precious gifts from your heart. If you are looking for gifts for loved ones, it sure take times to think and what to purchase. With Internet access today, we can shop online for precious gifts which is meaningful. Look at t-shirts above, so many choices for the boys. Above is just some photos I snap using my phone, there's more choices you can see from the website. I love this Little boy t-shirt, it's so cute and you can type in name of your child. 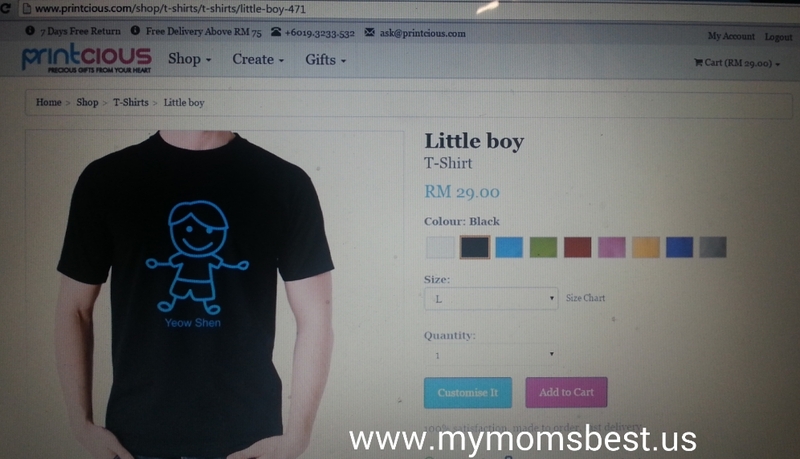 Many colors to choose from this Little boy's shirt, color of white, black, blue, red, pink, yellow, blue and grey. 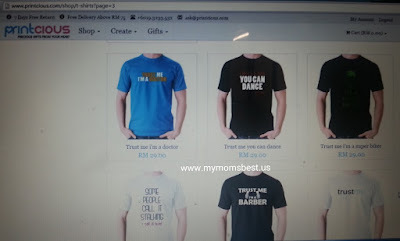 The t-shirt cost with price range of RM19, RM29, RM39 each t-shirt. My 9 years old son no longer fits in children's t-shirt. He's wearing adult's shirt, will be nice to order one for him. 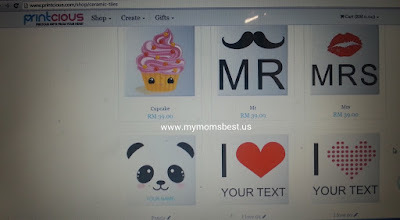 I wanted to find a t-shirt for mother and son, which is one for me another for my son. So I found the below shirt from Printcious. 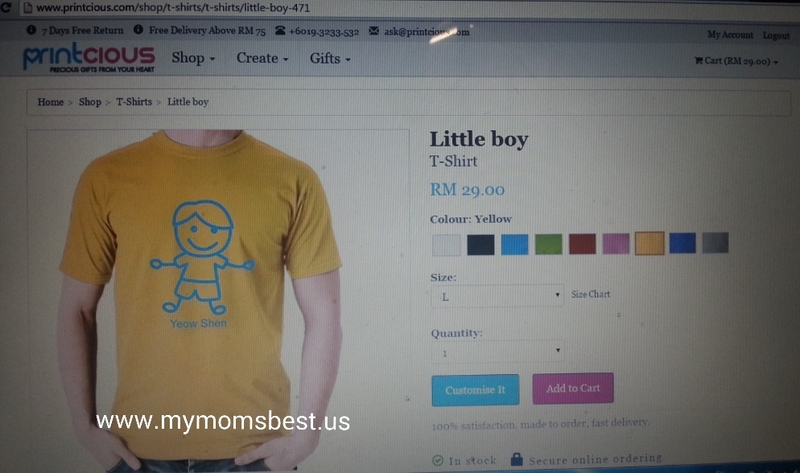 Perfect t-shirt for me and with the matching color of yellow! 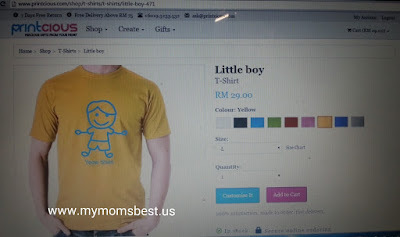 The t-shirt is perfect for mommy like me. 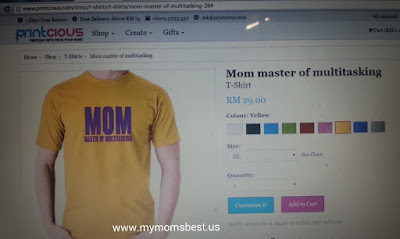 Mom master of multitasking printed on this t-shirt! Can't think of a precious gift for loved ones? 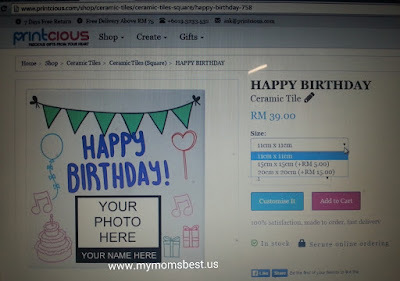 Why not the ceramic tiles as gifts? You won't be surprise that some of your office mates are having ceramic tiles on their table. 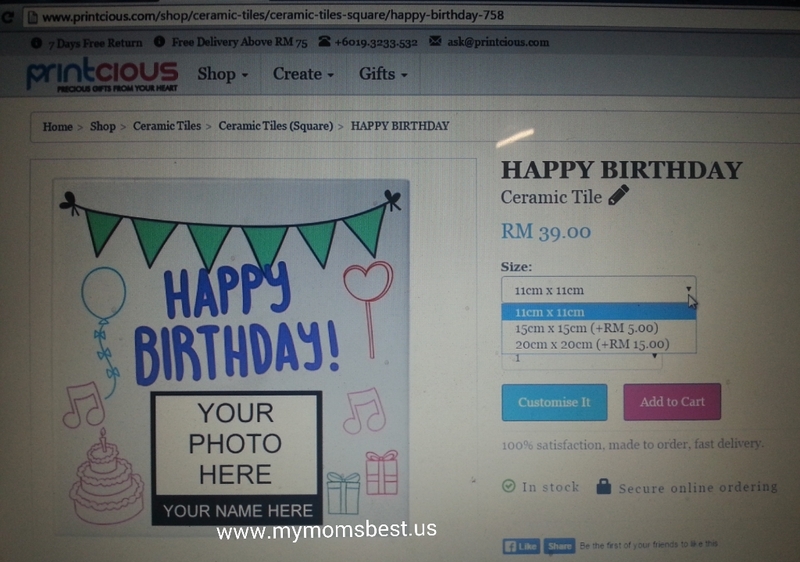 If you want to have a Happy Birthday ceramic tile for precious one. It depends on the size that you like to customize. You can choose from size 11cm x 11cm, 15cm x15cm and 20cm x 20cm. Some fees will need to be add on for the sizes. Who loves mug collection? I come to know some friends that like to keep mugs. Check out these mugs as you can personalized them with name or photo of your own. 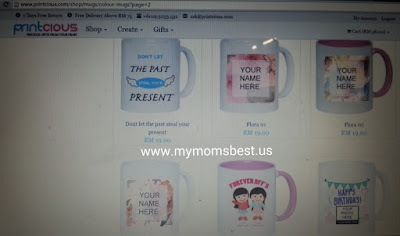 They have many choices of mugs on the website. 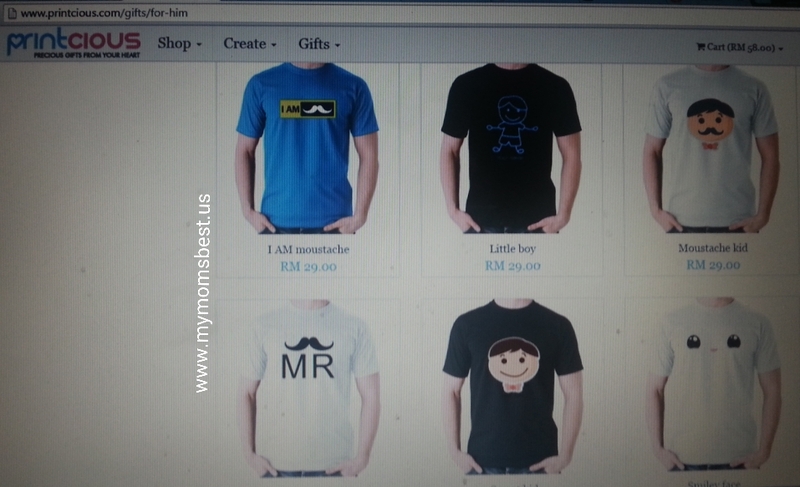 They have many moustaches mug to choose from, do login or sign up an account now to see the choices! Now everyone's home having at least one cushion, who doesn't need cushion at home? 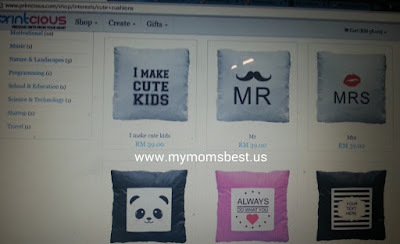 I saw these cute cushion available at this wesbite. Look there's one for him, one for her! Perfect gift for your friends that are getting married? You can even customize the cushion with your own words on it. 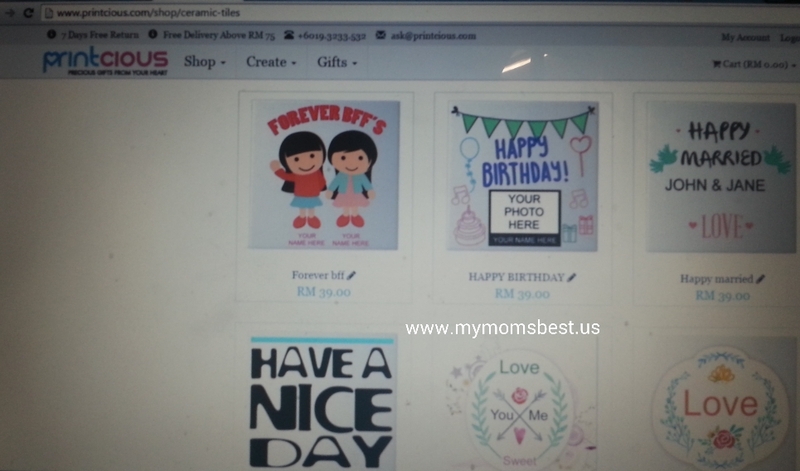 Don't just read here, now you can get start to shop online for precious ones at www.Printcious.com. yeah I have done my 2nd ordered. I wanna get a pair too. He he he. For me and hubby...and son too. great for family. Friday was sis in law's birthday and shirt I ordered came. But sadly the blue line so obvious and behind shirt has a blue dot too. After washed also cannot fade away. Its good to customise our shirt. Will purchase it for my Little Angels. yeah, the shirt for my sister-in-law cost RM39 not yet count courier fee.